Unite HERE members protested the new hotel plan from Rahm Investments and its rep Tulsee Nathu (right). The lack of progress on the council's request isn't unique to the hotel legislation. City staffers across multiple departments complain of being over-worked and shorthanded. 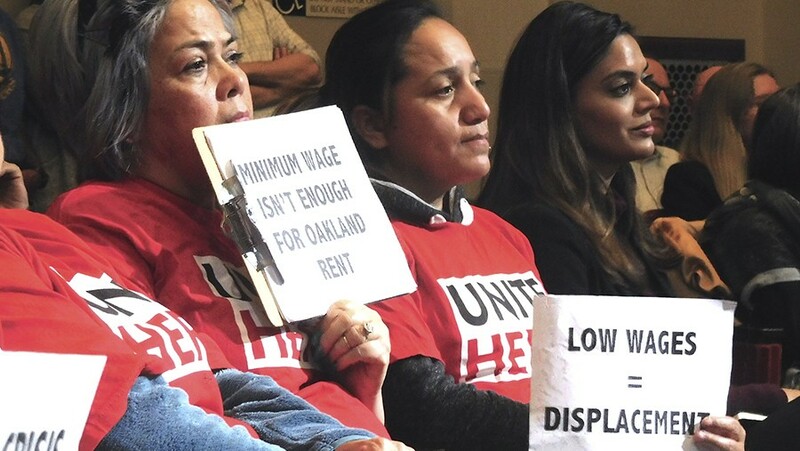 But Oakland hotel employees and their union say the city's delay is perpetuating a situation in which planning commissioners and their staff don't adequately analyze the wide-ranging impacts of businesses that pay substandard wages and benefits. "If a hotel offers low wages and no benefits, taxpayers will have to pay for that," said Taliah Mirmalek, a staff member of the hotel workers' union Unite HERE 2850 at last week's planning commission meeting. "Their charge is not to streamline development simply for the sake of development but to support the growth and development of our community," said Wei-Ling Huber, president of Local 2850, in an emailed statement. Huber said Oakland's current policy actually "accelerates the affordable housing crisis underway in our city" because low-wage workers can't afford the region's rising rents. The city's lack of progress on updating the planning code was on display at last week's planning commission meeting when commissioners heard a proposal for a new 220-room hotel on Mandela Parkway on the Emeryville border. The commission and its staff spent very little time discussing the project's potential economic impacts, even though records show that the developer, Rahm Investments, committed wage theft and violated other federal labor laws at its hotels in Amarillo, Texas. "Hotels are a great, quiet land use," Jim Heilbronner, the project's architect, told the commission. He also said the hotel would create jobs for Oakland residents, and that because it's located near bus lines, it wouldn't negatively impact transit. But planning commissioners noted that Rahm Investments wouldn't be required to stick to these commitments, because the company hasn't negotiated a binding jobs agreement with a union or the city. Oakland city planner Mike Rivera's report about the project's economic impacts also didn't include an analysis of whether hotel employees would be able to afford housing or if they would put an extra burden on social services due to low wages. In his 69-page report, Rivera addressed the quality of jobs in two sentences, the impact on housing in one sentence, the impact on transit in one sentence, and the impact on social services in one sentence. His conclusion was that the hotel would create new jobs and nearby bus lines could handle any transit impacts, therefore the hotel would be a positive economic addition to the regional economy. The sole condition of approval related to jobs that he recommended was that the hotel developer submit a "written proposal for review that reflects efforts to participate in a job fair that advertises job openings to local Oakland residents qualified for hotel hiring." It was this perfunctory sort of analysis that Councilmembers Abel Guillen and Dan Kalb hoped to stop when they proposed in May 2016 to update the planning code so that hotel developers would have to include a business plan, or "legally binding documents," showing how they would comply with the city's minimum wage and sick leave law. Such a document, if Oakland had one, could include penalties for hotel operators that violate it. The update also required planning staff and commissioners to undertake a more detailed analysis of how a project would impact the demand for housing, transit, and social services. And developers would have to submit a signed letter stating that the information they provide the city about wages and benefits is accurate. Guillen and Kalb's proposed planning code update was the result of a fight over a separate hotel project in 2016. Balaji Enterprises was seeking permission to build a hotel on 11th Street in downtown, but city investigators found that the company had recently violated Oakland's minimum wage law at another hotel it owns. The hotel workers' union and Chinatown activists opposed the project on the grounds that the company shouldn't be allowed to expand because it was generating only poverty-wage jobs and breaking the law. The union UNITE HERE 2850 appealed to stop the project by asking the commission to fully analyze the possible impact on workers, but the planning commission rejected this appeal after its staff wrote that the minimum wage law violations "are not within the purview of the Planning Commission to evaluate." Balaji Enterprises hired attorneys and appealed the city's findings, but Oakland officials ultimately ruled that the company violated the minimum wage law over a seven-month period in 2015. Eventually, the company and city reached a settlement last year regarding the minimum wage violation, with Balaji agreeing to pay $2,600 it owed to 24 employees. At last week's planning commission meeting, Commissioner Jahmese Myres asked planning staff about Guillen and Kalb's updates. Staffer Robert Merkamp told Myres that "strategic planning hasn't been able to work on it because they have competing priorities for their time." Those competing priorities include regulations on food trucks and short-term vacation rentals as well as projects like the redesign of the Broadway-I-880 pedestrian underpass. Because of the delayed code update, the commissioners had very little information about jobs, housing, and transit to consider. They spent part of the meeting questioning Tulsee Nathu, a representative of Rahm Investments, about her company's jobs plan. Nathu said her hotel would pay employees "higher than minimum wage" and provide scholarships to the children of employees. When asked how the city could be sure the company would do this, Nathu said, "I'm sure it's going to happen because we are owner-operators. We have top-ranked properties." When Commissioner Thomas Limon asked Nathu to describe challenges her company has had with labor issues at its other properties, she replied: "We encourage our employees to grow. Many are Spanish speaking. We tell our employees to say hello to the guests because it's good for them." She added, "I wish you could all come to see our hotels. Unfortunately, we don't have any in California." Nathu was asked directly by the commission about her company having violated federal labor laws at hotels in Texas. "I'll have to dig into it," she responded. "We've been in business so long of course we're going to have issues." Even though planning commissioners couldn't take the company's labor practices into account, they delayed approving the hotel project pending several more community outreach meetings. The meetings, however, won't bind the developer to any commitments. According to U.S. Department of Labor records, federal investigators found that, in 2005, two hotels owned by Rahm Investments in Amarillo, Texas failed to fairly compensate dozens of employees for overtime and failed to adequately keep payroll records. In total, the hotel owners failed to pay 53 employees a total of $29,000. The labor department initiated its investigations at the Amarillo Hampton Inn & Suites and Fifth Season Inn, also located in Amarillo, after receiving complaints from employees. Labor Department investigators wrote that "the same employer has a past history of the same types of violations," because in 2003 it committed a similar wage theft violation at yet another Texas hotel. Investigators also wrote that the employer manipulated interviews between government investigators and its employees and falsified records. The labor department ordered the hotel company to pay the back wages owed to its Texas employees.